Perfect suburban neighborhoods are not as perfect as they look is one of the main themes of "The Chumscrubber" the debut film for director Arie Posin. Psycho suburbanites are nothing new when it comes to the movies. The crown jewel being David Lynch's 1986 film "Blue Velvet" and 1999's "American Beauty". It has become a little cliché but "The Chumscrubber" does a decent job thanks to its talented ensemble cast. The main protagonist is Dean a high school student played brilliantly by Jamie Bell. He's a loner and a misfit but the most grounded and down the earth of the characters. He is the heart of the film that everything revolves around. The main plot is really more of a teen drama that shows how parents have no idea who their kids are, another easy stereotype. An opening scene shows Dean finding the body of his best friend Troy who has hanged himself. All of this taking place during a dinner party thrown by Dean's mother. He walks back home in a state of shock, unable to tell anyone. The story itself takes place in a southern California cul-de-sac, all of the families involved are intertwined in each other lives but all too often are just involved with themselves. Everybody spends so much time and effort improving and promoting themselves that they have lost all meaningful contact with everyone around them. Dean's father is a self-help guru who uses him to sell his books, while his mom hawks Veggie Force vitamin supplements. Every family seems to be in a similar situation. The kids are forced to raise themselves. Dean's departed best friend Troy was the school "happy pill" dealer and now a group of cool kids are after him to recover his lost stash. Good Ole Camilla Belle plays the hot girl, Crystal, who is now interested in Dean but her motives are a little foggy. While Billy the school's arrogant douche bag (Justin Chatwin) is crazy enough to do anything to get those pills. The third member of the group is Lee (Lou Taylor Pucci) who just blindly follows the crowd like a lonely lost sheep. This rears its ugly head near the film's climax. Billy hatches a plan to kidnap Dean's little brother to get the lost pills but that goes awry when they pick up the wrong kid. The kid actually kind of likes being kidnapped and hanging out with the group. His mother doesn't even realize he is missing for a couple of days. The script is tightly structured with many storylines going on simultaneously almost like a ballet. They all come to a head and people become aware of their misdeeds, but will it make them better people or is it just business as usual. Dean is able to fully accept and grieve for Troy and move on, while Billy is not so lucky. 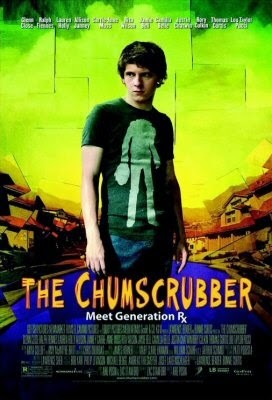 Why is it called The Chumscrubber? You'll just have to watch the movie and find out for yourself. It's now available on DVD which also includes has a commentary track so check it out!